Recently I visited the breathtaking city of Hong Kong to speak at the seventh-annual Mines and Money conference, Asia-Pacific’s premier event for mining investment deal-making and capital-raising. 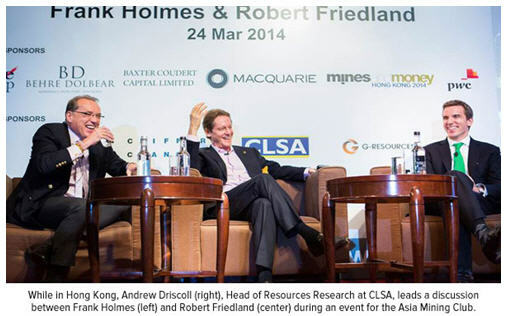 During my time in Asia I had the additional privilege of addressing the audience of the Asia Mining Club, alongside my good friend Robert Friedland, Executive Chairman and Founder of Ivanhoe Mines. The mission of the Asia Mining Club is to promote education among its members, and one way to achieve this is by hearing from experts in the financial markets, notably those focused on resources and commodities. During the club’s sell-out event, I too, confirmed a great deal about the commodity “buzz” on that side of the world, especially on gold. The demand for the precious metal in Asia is truly phenomenal! In smaller countries like Indonesia, Thailand and Vietnam, consumption of gold totaled 300 tonnes in 2013, and according to Bloomberg, in 2014 mainland Chinese buyers purchased a total of 125 tonnes in February (including scrap). This number tops the 102.6 tonnes purchased in January and 97.1 tonnes purchased a year ago. As I wrote about in February, Switzerland plays a role in the movement of physical gold into Asia as well. Home to many of the big gold refiners, Switzerland released monthly gold trade data this year for the first time in over 30 years, with the report showing that 80 percent of shipments went straight into Asia. If we continue to see these large movements of the physical metal, especially from the West to the East, it’s only a matter of time until these supply-and-demand factors lift the gold price. I often say there are two sides to the gold equation: the Love Trade and the Fear Trade. While Asia’s cultural affinity for gold continues to feed the Love Trade, concern over government policies which increase inflation and devalue currencies, fuel the Fear Trade. The Fear Trade demanded attention again on the back of Janet Yellen’s talk of the Federal Reserve raising interest rates in the next six months. While low interest rates make it less expensive to borrow money, measures to keep rates low also chip away the value of the dollar and cause concern of accelerating inflation. Once real rates start rising, gold isn’t as attractive to those who trade on fear. As I’ve written about recently, a key driver in gold prices is the real interest rate environment—the real rate of return taking into account the level of inflation. When real interest rates are negative to low, gold prices historically turn positive because there is no opportunity cost to hold the metal. The lower the real rates, the better gold tends to do. So, Yellen’s initial hint of rising rates sent gold prices falling. On Friday the March U.S. jobs number came in at 192,000. While the number is in line with expectations and clearly shows that hiring in the U.S. is rising, it fell a bit short of the 200,000 jobs projected. The number was just enough of a miss to disturb investor confidence and drive some to seek refuge in hard assets, spurring the price of gold again. BCA Research believes that after Friday’s report, the current pace of employment will be sustained. Although the movement is gradual, hiring is going up. 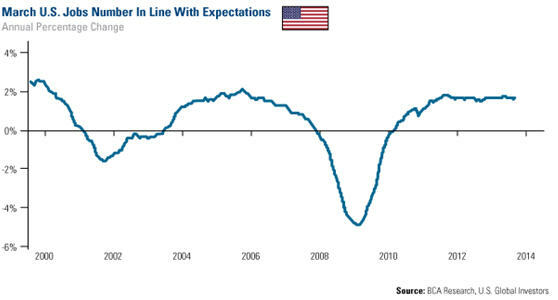 In my opinion, even with job numbers in line with expectations, the Fed is still going to focus on long-term job creation and keeping interest rates low, or at least not rushing to normalize them as BCA research stated. If inflation starts to rise while these rates are low, we could see a higher movement in the price of gold. The sour part is that by our models, which look at relative value of assets, it appears that both Osisko and Yamana are paying too much on this deal. On the flip side, the sweet part is that this bid caused companies like Mirasol, Pretium and SEMAFO to immediately rise. The structure of the entire deal is a complicated one, but witnessing these stocks finally waking up, is a change in the sentiment for the gold sector that, in my opinion, needed to be seen. At U.S. Global Investors we are always watching for opportunity, while concurrently managing risk. Along with the “sweetness” of the Osisko deal, I find additional encouragement for the broader commodities space, as well as for gold, from Stifel Nicolaus’ Barry Banister. His strategy for the second quarter of the year is that we may see a one-year rally in commodity-related stocks. 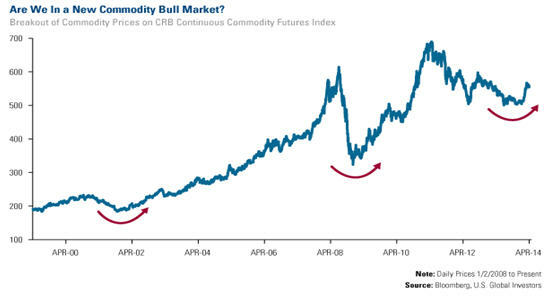 Based on the breakout of the Continuous Commodities Futures (CRB) Index, along with the movement in the U.S. dollar, he forecasts that commodities could rise 15 percent year-over-year in 2014. 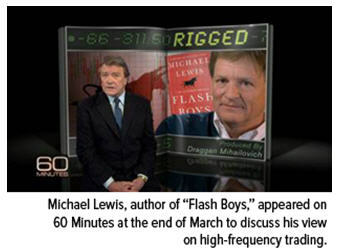 High Frequency Trading became a household word overnight when bestselling author Michael Lewis gave an interview to 60 Minutes in advance of his new book, “Flash Boys.” Lewis’ allegations of high frequency trading practices that result in a rigged stock market have prompted a firestorm of support from Charles Schwab to Mark Cuban. for our commodity and equity exchanges.” I’m glad to see this issue getting the attention it deserves. From short selling to overreaching regulation, over the years I’ve shared my opinions on practices that harm individual investors and create unjust advantages in our free market system. I believe that investing is key to long-term wealth creation and that investor confidence in the system is key to capitalism. The first quarter of the year has certainly provided surprises for the gold market, but remember that every coin has two sides. Every downward data point has an upside opportunity. Follow the smart money, stay diversified and remain a curious investor. p.s. Don’t miss my new show on Kitco. Each week I’ll talk about the strengths, weaknesses, opportunities and threats in the gold market on Gold Game Film. All opinions expressed and data provided are subject to change without notice. Some of these opinions may not be appropriate to every investor. Past performance does not guarantee future results. The Continuous Commodity Index (CCI) is a broad grouping of 17 different commodity futures, which is a benchmark of performance for commodities as an investment. The following securities mentioned in the article were held by one or more of U.S. Global Investors Funds as of 12/31/13: Goldcorp, Mirasol Resources Ltd, Osisko Mining Corp., Pretium, Resources, Inc., SEMAFO, Inc., Yamana Gold, Inc.